A sad picture for a sad weekend. It's almost laughable how many things went wrong this weekend. 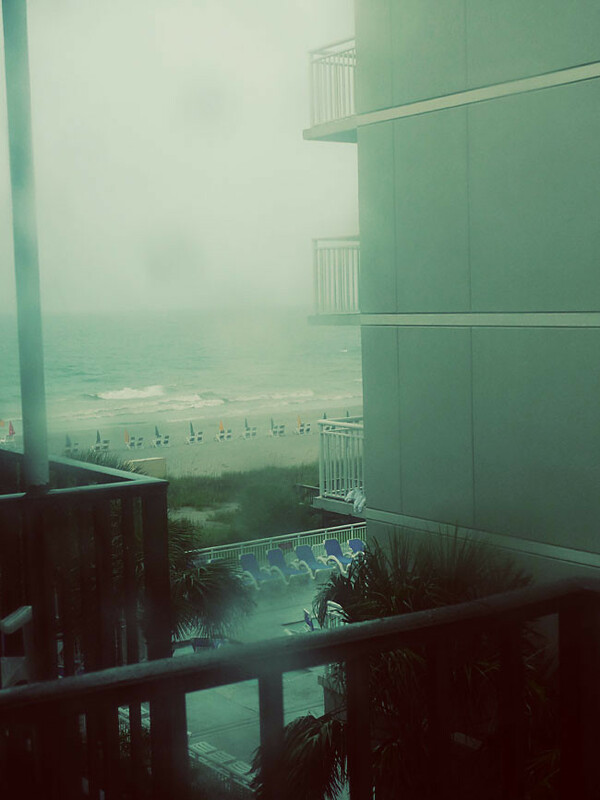 It should have been a simple trip to Myrtle Beach, but then a 4 hour drive turns into 7 hours, Google Maps decides to play games with us, and we end up in a hotel that looked like it was in a 20/20 murder documentary (after I spend 1.5 hours talking to the front desk and Expedia). Picture someone's brother's dorm room attached to a Waffle House bathroom.... Apparently at Expedia, that's a "3 star resort." After waking up to a torrential thunderstorm at 6 am, we called it quits, jumped back in the car, and came home. And had a very pleasant evening. And decided never to go back. - Jim Gaffigan, who was the whole reason for the trip. He was fantastic, but didn't quite make up for all the mishaps. - Cory and I carrying our luggage cart up the stairs. No elevator. Why offer us luggage carts?! It was like something from Candid Camera. That sounds awful; I'm sorry I'm laughing. that's ok, you guys can laugh away... at least some happiness can come from our mishaps! i hope my comment didn't sound mean. what i should've said was "we both said oh no and felt badly for you and also laughed because it sounds like something that would happen to us!" Oh no, your comment didn't sound mean at all! I realize the whole story is completely ridiculous, and every one I've told it to has laughed... so no worries! I tried the whole "let's get out of here and just get our money back" but was repeatedly told "No, you've already checked in" ... how was I supposed to know how gross it was until we checked in?! We hadn't even touched anything yet! But anyways, it was already after midnight and everything around us seemed to be booked up anyways.